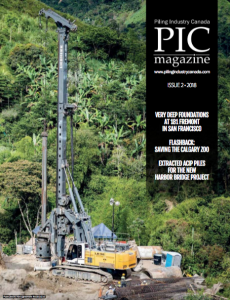 Deep Foundations Institute (DFI) announces that BAUER Maschinen GmbH and BAUER Spezialtiefbau GmbH will be presented the 2013 Ben C. Gerwick Award for Innovation in the Design and Construction of Marine Foundations at a dinner in Seattle, August 1. The dinner is being held in conjunction with DFI’s Marine Foundations Seminar, a 1.5 day seminar featuring 14 presentations by owners, contractors and engineers on challenging marine foundation projects. The two companies are being recognized for the development and implementation of the Bauer Seabed Drill 3000, a seabed mounted drill unit that can be installed and operated by a work boat rather than a jack-up or large semi-submersible marine derrick. This innovation reduces installation costs of large diameter drilled/socket piles by allowing the use of less costly equipment. In addition, the unit enables the installation of piles in extreme side conditions such as a high current situation. The annual award recognizes innovative excellence in the design and construction of marine foundations, and honors Ben C. Gerwick for his achievements during his 62-year career in the field of marine foundations. The award is sponsored by the Deep Foundation Institute Educational Trust, University of California Department of Civil and Environmental Engineering, and the Ben C. Gerwick Company.